Ukulele is one of my favorite instruments to play. They have such a beautiful voice – sweet, full, vibrant tone. I feel the Hawaiian vibe it delivers, and that is the best sensation. But for some people this sweet and kind of soft sound cannot be enough. Sometimes you might still want to get traditional sound, but with more power and edge to it. That is exactly why electric ukuleles were invented. You get the original tone as well as electrified one. In this article I will give you general information about electric ukuleles and how do they differ from the original one. I made a research into this matter and prepared the list of best electric ukuleles that are available on the market today. Here goes the list. Enjoy. Oscar Schmidt OU2E Mahogany Concert Acoustic-Electric Ukulele Bundle is definitely what you were looking for if you are just starting out in music. The instrument comes in all-inclusive package, so once you get it you will be able to rock out. Plus, additional accessories usually cost a lot of money, so if you are on a budget, fully packed bundles undoubtedly are things to look for. The pack includes Gig Bag, Austin Bazaar Instructional DVD, Clip-On Tuner, and Polishing Cloth. They are all very much needed and useful. The instruments body is made of mahogany, that enables for the full and sweet sound. Thin neck, with rosewood fingerboard enables for easy and fast playing. The instruments design is very minimalistic and natural, with satin finish. Oscar Schmidt OU2E Mahogany Concert Acoustic-Electric Ukulele features active pickup system, so it will stay in tune for a long time. This instrument has surely a lot to offer for such a budget friendly price. Cordoba never ceases to amaze us with how well it can combine affordability and high-quality craftsmanship, together with amazing sound and impressive look. The instruments aesthetics are truly work of art. Cordoba uses Portuguese ornamentation and exotic woods to create exquisite design. The instrument is fully handmade. Pretty impressive huh? Mahogany body adds full tone of a tenor uke to the instrument. It has slim neck, with rosewood fingerboard that delivers easy playability. The instrument has nice hardware, so will hold the tune pretty well. Aquila Nylgut strings add more clarity and vibrancy to the tone. Cordoba 20TM Tenor Cutaway Acoustic-Electric Ukulele comes in all inclusive package, so you get all the necessary accessories – Hard Case, Tuner, Austin Bazaar Instructional DVD, and Polishing Cloth. Additional accessories generally cost a lot so this package is undoubtedly a great deal for the price. 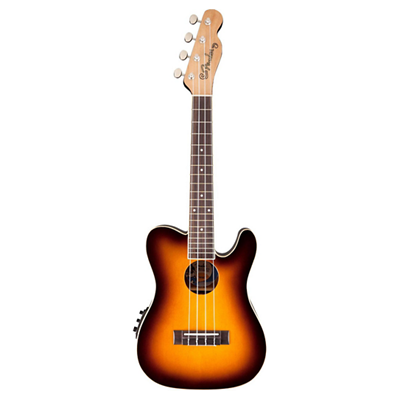 Fender Ukulele ’52 – Sunburst one of the most affordable electric ukuleles from the list above. It is shaped like a Telecaster. The instrument has spruce top and mahogany back and sides, to deliver full and sweet tone, when unplugged and have big power when connected to amp. This uke will be a perfect partner on your live shows and recordings as it stays pretty sturdy. Super thin mahogany neck with rosewood fingerboard will let your hand glide like a breeze on a smooth surface, so you will definitely not get tired after hours of playing. Beautiful sunburst design gives it amazing look. Nice bone saddle and bone nut delivers crisp sound. This uke is equipped with solid tuning system, so coming out of tune will surely not be a big of a problem. 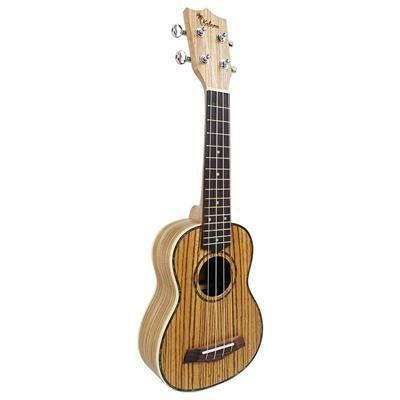 The overall performance that Fender Ukulele ’52 delivers is very high quality. The instrument is perfect for beginners as well as for experienced players. It definitely is a great deal for the price. The incredible uke surely delivers the most authentic vibe of Hawaii. If you look at its aesthetics you can feel the mark of Hawaiian traditions, and history on the body. Not only does it look good, but sounds good as well. The body of this uke is made of select mahogany, so delivers nice, full tone, both plugged or unplugged. The body of this uke is covered in lots of tattoos. The engraved drawings are based on waves and sharks’ teeth which are also echoed as fret markers. The symbols have sea theme. The strong geometric pattern black tattoos on brown skin will impress anyone who sees and plays this amazing uke. The instrument rarely goes out of tune. 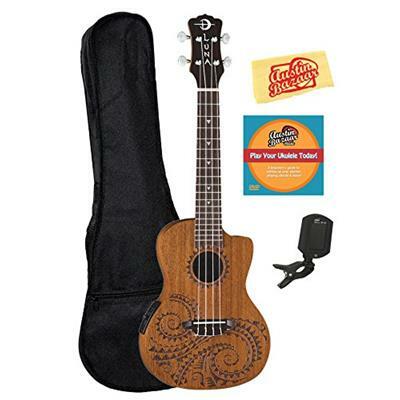 This uke comes in all-inclusive pack, so the minute you get it you will be equipped with all the needed accessories. Luna Tattoo Mahogany Acoustic-Electric Concert Ukulele will produce nice sound in a budget friendly package. The exotic design of this beautiful uke surely will teleport you somewhere on an island, or on any kind of adventure. We would definitely recommend you to give it a shot. When picking the perfect instrument to enjoy for years to come, having numerous options is important. Your taste in musical instrument often depends first on how they look and then how they sound, especially if you are a beginner in the musical world. Which is why it is nice to have two versions of the same exact model easily available. The Kulana Deluxe Soprano Ukulele is a a nice little piece of electric ukulele that you could pick up for less than 50, which on its own is amazing. Though the manufacturer kicks it up a notch, offering you two tonewood variations: the traditional mahogany or the more exotic zebrawood. Both options sound great, through the mahogany has a tendency to sound a little better than the zebrawood, sacrificing the unique looks which would attract the first time buyer. The rest of the ukulele is pretty much traditional, with pre installed strings and the nut/saddle/bone all being nicely made. Picking this option up will also land you a nice gig bag. A good option for beginner Ukulele players looking for an easy, affordable electric ukulele. If you are a beginner, you might get confused by looking at ukuleles. They look like mini guitars. Well, I certainly got a bit confused the first time I saw this instrument. We cannot be blamed for thinking like this. In reality ukulele has almost nothing similar to guitar. They are different in size, principle of operations and generally how the instrument behaves. Guitar has completely different tuning from uke. So, if you know how to play a guitar it will not be a big of a help in playing uke. You will know generally how to position hand, or usual strumming patterns, but the chords and everything else is completely different, so you will need to start from the very beginning. Ukulele has four strings, whilst guitar has 6 and its standard tuning is G – C – E – A. Each string has a different key, so guitar chord will be useless here. Ukes sound differs from guitar sound a lot, it is softer in some ways and less powerful, lacks volume but surely has clarity. You can find four sizes of ukuleles. From smallest to biggest the order will go like this: Soprano, Concert, Tenor, Baritone. I will describe each one of them briefly. They differ from each other with sound, power etc. The biggest is the most powerful and has more of a guitarlike sound, whilst the smallest has pure, authentic ukulele sound. When we say electric ukuleles, it can mean three different types of ukuleles. Solid Body Electric – Which can be described as an electric guitar of a uke size. Electro-Acoustic – Which we will describe in details in the article. Acoustic w/ Pickup – is primarily designed to sound best acoustically – a hollow-body ukulele with an added piezo pickups. So, what exactly are these electric ukuleles? I surely had that question the minute I heard such kind of instrument existed? Well… let me explain. Electric ukuleles are just original ukes that are amplified. They sound normal when you unplug from the amp. If you add passive pickups to any kind of traditional uke, you will get electric- acoustic one. The same method is used in making electric- acoustic guitars. Those ukuleles are generally equipped with nylon strings. These kinds of ukuleles mainly go for the look of metal-strung electric guitar. Electric ukuleles come in the same four standard sizes as acoustic ukuleles. So, the main aim of electro acoustic ukuleles is to produce the most authentic, traditional sound of a uke, when unplugged and add more power and edge of an electric to it when connected to amp. When talking about ukuleles, we need to explain things that affect its overall performance most of all. The material of top affects instruments sound most of all. Ukes can be made of lots of materials, but the most popular among them are Koa, Mahogany and Spruce.The sound is also affected with the material being laminated or solid. The origin of koa is Hawaii, so Hawaiian ukes are generally made of it. The sound produced by koa is nice and sweet. Ukes crafted with koa are generally very expensive. As for the Mahogany, generally it is less expensive, so perfect if you are looking for an affordable instrument. The sound it delivers is a bit softer than Koa. The spruce produces a nice, full, vibrant tone. It is generally used on the lower end ukuleles. As I have told you, material can be laminated or solid. Solid material means that the whole top is of a very high-quality wood, consequently the sound is more authentic, full and sweeter. Solid wood is expensive. Laminated wood is a much cheaper version. In this case cheaper wood is used on the inside one, thin layer of nice wood is used on the outside. It affects the look but not sound, at all. So definitely go for the solid one. To sum up this article, I have given you the general information about electric ukuleles. Now you surely have idea about the differences between original uke and electric one. I also gave you the list of best electric ukuleles available on the market today. Even though original ukuleles have amazing, sweet voice, sometimes it cannot be enough. You might want to get the soft and full tone it produces, but with more power and edge of electric. That is exactly why electric uke can be a perfect solution. They have the soft, traditional side of ukes as well as growling, modern of an electric. Those two sides are combined in the best way possible, so if you want to get 2 in 1, go for the electric uke. Hope the article was helpful and you made up your mind about which model to get. Wish you all the best of luck.